Our value is founded on a unique and deep understanding of risks, vulnerabilities, mitigations, and threats. Domestic Surveillance plays a vital role in our national security by using advanced data mining systems to "connect the dots" to identify suspicious patterns. In the past, domestic law enforcement agencies collected data AFTER a suspect had been identified. This often resulted in lost intelligence and missed opportunities. But what if data could be collected in advance, BEFORE the target was known? What if the mere act of collecting data could result in the identification of new targets? What if we could build a national data warehouse containing information about every person in the United States? Thanks to secret interpretations of the PATRIOT ACT, top-secret Fourth Amendment exceptions allowed by the Foreign Intelligence Surveillance Court, and broad cooperation at the local, state, and federal level, we can! Every day, people leave a digital trail of electronic breadcrumbs as they go about their daily routine. They go to work using electronic fare cards; drive through intersections with traffic cameras; walk down the street past security cameras; surf the internet; pay for purchases with credit/debit cards; text or call their friends; and on and on. There is no way to predict in advance which crucial piece of data will be the key to revealing a potential plot. The standard operating procedure for the Domestic Surveillance Directorate is to "collect all available information from all available sources all the time, every time, always". The PRISM program is our #1 source of raw intelligence and consists of data extracted from the servers of nine major American internet companies. In the spirit of openness and transparency, we have embedded the Twitter feed from the NSA_PRISMbot which periodically posts random samples of PRISM collection data. 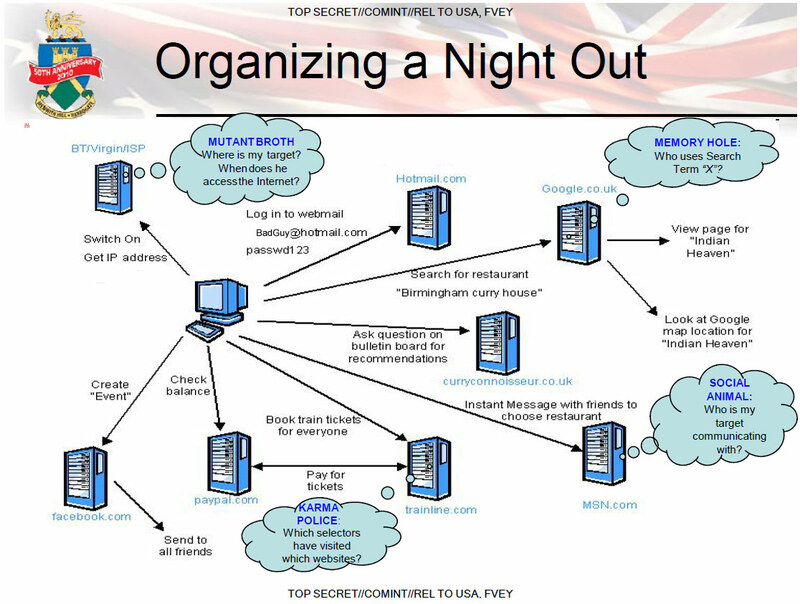 GCHQ, our UK surveillance partners across the pond, created this handy explainer diagram below to illustrate how easy it is to follow the data trail of ordinary internet users. For information on how we collect your data, visit our Surveillance Techniques page on this website. For information about our new state-of-the-art Surveillance Data Center, visit our Utah Data Center information page. We treasure the U.S. Constitution and the rights it secures for all the people. In a world in which privacy has become illusory in so many areas of our lives, the Domestic Surveillance Directorate maintains the highest standards of integrity and lawful action. Your private data is safely secured using our custom database software called Cloudbase, which has fine-grained security to control access down to the cell level. Incoming transactional data is analyzed against a continually evolving threat matrix and is assigned an action code. The vast majority of these transactions are routed directly to a permanent static storage state. In fact, for most Americans, your data is never accessed or viewed by anyone within the US Government unless some future event triggers an inquiry. We work closely with our partners in the Intelligence Community to ensure that your stored data is released only as a result of a "national security" request. Our strong commitment to keeping the Nation safe includes an important role in maintaining the Continuity of Government. Since the early 1980s, the federal government has used its secret Main Core database to track dissidents and watchlisted Americans in the event of a national emergency. The roots of the Domestic Surveillance Directorate can, in fact, be traced back to the early days of this program. We are proud to continue this tradition by sharing our data with the modern-day COG program. Learn more about this. In 2006, the Intelligence Advanced Research Projects Activity (IARPA) was created to invest in high-risk, high-payoff classified programs uniquely designed to provide research and technical capabilities for the Intelligence Community. IARPA-funded researchers are currently studying novel ways of processing and analyzing the explosive growth of domestic data. The Aladdin program seeks to extract intelligence information from the high volume of videos uploaded to the internet. The Babel program is developing agile and robust speech recognition technology that can provide effective search capability for analysts to efficiently process massive amounts of real-world recorded speech. The Knowledge Discovery and Dissemination (KDD) program will develop advanced analytic algorithms that can effectively draw inferences across multiple databases to allow the Intelligence Community to create virtual fusion centers enabling analysts to produce actionable intelligence. The Socio-cultural Content in Language (SCIL) Program will develop novel algorithms, techniques and technologies to uncover the social actions and characteristics of members of a group (ie; within discussion forums, online comment sections, social media, etc.) by examining the language used in relation to acceptable social and cultural norms. The Reynard Program starts from the premise that "real world" characteristics are reflected in "virtual world" behavior. The program seeks to identify behavioral indicators in online virtual worlds and "massively multiplayer online games" that are related to the real world characteristics of the users. Attributes of interest include gender, age, economic status, educational level, occupation, ideology or "world view", and physical geographic location. In recent months, numerous Top Secret documents have been leaked to the media relating to surveillance activities carried out by the Intelligence Community. In an effort to increase transparency, a new website called "IC OFF THE RECORD" has been created to provide immediate, ongoing and direct access to these unauthorized leaks. This is a parody of nsa.gov and has not been approved, endorsed, or authorized by the National Security Agency or by any other U.S. Government agency. Much of this content was derived from news media, privacy groups, and government websites. Links to these sites are posted on the left-sidebars of each page.